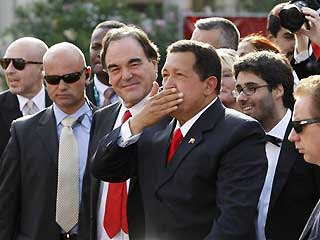 So nice to see another of the Hollywood elite kissing the fat tush of Venezuelan thug Hugo Chavez. Hundreds of admirers, some chanting "president, president," gathered outside of the for the leader's arrival. A few held up Venezuelan flags and a banner in Spanish that read "Welcome, president." The leftist leader is getting a chance to hob-knob with the Hollywood elite as the central focus of Stone's film "South of the Border" — a look at what Stone calls the "truth" about Chavez's role in the sweeping changes in South America. Chavez has been an outspoken critic of U.S. policy and often made headlines for likening President George W. Bush to the devil. The film, which is a series of interviews and clips from U.S. media reports, tells the story of Venezuela's so-called "peaceful revolution" since Chavez came to power in 1998. Chavez is portrayed as a hero of the people who refuses to be bullied, Reuters reported. "You can't get a fair hearing for Chavez. It's an outrageous caricature they've drawn of him in the Western press," said Stone told Variety. Yes, such a pity he hasn't been able to shut down our media as he's largely done to any opposition media in Venezuela. I guess Stone will do a sequel covering that. Meanwhile, Stone's new buddy gushed about Barack Obama, short one Communist buddy since Van Jones departed in the dark of night over the weekend. Maybe the two can pal around and have a beer at the White House. Venezuelan President Hugo Chavez, a fierce critic of U.S. foreign policy who once called George W. Bush "the devil," said on Monday he hoped to be able to work more closely with President Barack Obama. Chavez was in Venice for the world premiere of "South of the Border," director Oliver Stone's sympathetic portrait of a leader he says has championed the poor and who has been unfairly demonized by the U.S. media. "I have no reason to call him (Obama) the devil, and I hope that I am right," Chavez told reporters in Venice. "With Obama we can talk, we are almost from the same generation, one can't deny that Obama is different (from Bush). He's intelligent, he has good intentions and we have to help him." I guess building a "nuclear village" with Iran can be a topic of discussion.